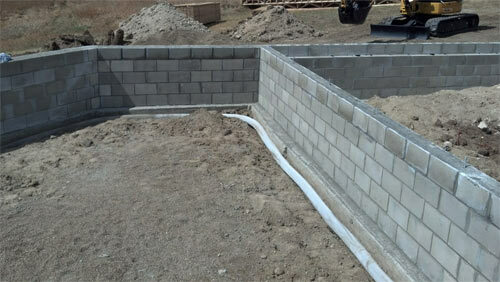 A drain tile system, also called a French Drain, is designed to collect and redirect water seepage away from the house. Drain tiles can be installed either on the interior perimeter of the foundation or along the exterior as a house is being built. Exterior foundation drain tile being laid out during construction. Drain tiles basically consist of a perforated pipe (typically a PVC pipe with weep holes along one side) set in a trench and covered with gravel. Some contractors cover the pipe with a nylon filter sock to prevent the pipe from filling with debris. Usually the water that enters the pipe is then redirected to the sump pump or away from the foundation by gravity flow. Most drain tile systems are designed from the same concept. The differences come in the materials, shape of the pipe, and placement. Before the 1950s, drain tiles were made of a red or orange clay material. The original drain tiles had no holes in the pipe, but instead the sections were laid with a quarter-inch space between them to let in water. Now, drain tiles are made with plastic or PVC perforated pipes. Manufacturers have designed drain tile pipes in various shapes from round, rectangle, and square to oblong variations or pipes vents with multiple openings for increased flow. While the main difference in placement is outside versus inside the basement, there are mainly three different placement options for interior drain tile systems. Interior drain tile systems can be placed either above the concrete slab, within the slab edge or under the concrete slab. The most common placement for drain tile systems in existing homes is below the concrete slab. To install this option, a portion of the basement floor is removed (approximately 12-24 inches from the concrete floor). Then, a trench is dug and the pipe is set in place and covered with washed gravel. Usually contractors install a waterproofing product to direct water that enters through the foundation wall to the drain tile. The concrete is then replaced. Exterior drain tiles, more commonly know as footing drains, are usually installed during construction. The drain tile around the outside of a foundation acts as a piping system to collect and redirect subsurface water that moves down into and through the soil. Installing an exterior drainage system at an existing building is the most costly, but also the most effective water control approach. This requires digging up the area around the foundation and rebuilding it similar to a new house installation. It also requires digging up shrubs and other obstacles around the house. Exterior drain tiles can be placed beside or on top of the footing. All exterior drainage systems must drain to a sump that can be pumped out. We will submit your proposal to qualified and screened contractors and have them bid on your project. This will save you the time and effort to find qualified and trusted contractors. Have Contractors compete for your business not the other way around! Basement Questions is a consumer devoted website intended to assist the homeowner with commonly occuring basement and foundation problems. There is no advertising or promotion of products by contractors or manufacturers. We simply offer answers for your basement questions. If you need a Contractor, we will do the leg work for you. We will find a reputable contractor experienced in the area of work you need help with. Tip #37. What advantages do IR thermography inspections offer to new construction buildings? Valuable information is gained through competent analysis regarding moisture assessments, remediation oversights, energy audits, roof and electrical system inspections, and water damage investigations. Scheduling a few inspections during construction can ensure proper workmanship and identify faulty materials before the repairs/replacements become costly inconveniences. © Copyright 2016-2019: Cyberspace Marketing Corp. All Rights Reserved.